Ganesh Chaturthi is celebrated on the birthday of Lord Ganesh (Ganesha), the god of wisdom and prosperity on the fourth day of the moons bright fortnight, or period from new moon in the lunar month of Bhadrapada. The celebration of Ganesh Chaturthi continue for five, seven, or ten days. Some even stretch it to twenty one days, but ten the most popularly celebrated. In the tradition of the right hand path the first day is the most important. In the left hand path tradition the final day is most important. Ganesha is the god of wisdom and prosperity and is invoked before the beginning of any auspicious work by the Hindus. It is believed that for the fulfillment of one's desires, his blessing is absolutely necessary. According to the mythology, he is the son of Shiva and Parvati, brother of Kartikeya - the general of the gods, Lakshmi - the goddess of wealth and Saraswati-the goddess of learning. There are numerous stories in Hindu mythology, associated with the birth of this elephant-headed god, whose vehicle is the Mooshak or rat and who loves Modaks (droplet shaped Indian sweet). Legend has it that Parvati created Ganesha out of the sandalwood dough that she used for her bath and breathed life into him. Letting him stand guard at the door she went to have her bath. When her husband, Shiva returned, the child who had never seen him stopped him. Shiva severed the head of the child and entered his house. Parvati, learning that her son was dead, was distraught and asked Shiva to revive him. Shiva cut off the head of an elephant and fixed it on the body of Ganesha. Another tale tells of how one day the Gods decided to choose their leader and a race was to be held between the brothers- Kartikeya and Ganesh. Whoever took three rounds of the earth first would be made the Ganaadhipati or the leader. Kartikeya seated on a peacock as his vehicle, started off for the test. Ganesh was given a rat, which moved swiftly. Ganesh realised that the test was not easy, but he would not disobey his father. He reverently paid obeisance to his parents and went around them three times and thus completed the test before Kartikeya. He said, " my parents pervade the whole universe and going around them, is more than going round the earth." Everybody was pleasantly surprised to hear Ganesha's logic and intelligence and hence he came to be known as the Ganaadhipati or leader, now referred to as Ganpati. There is also a story behind the symbolic snake, rat and the singular tusk. During one of his birthdays, His mother, Parvati, cooked for him twenty-one types of delicious food and a lot of sweet porridge. Ganesha ate so much that even his big belly could not contain it. Mounting his little mouse, he embarked on his nightly rounds. His mouse suddenly stumbled upon seeing a huge snake. To adjust His belly, Ganesha put the snake on as a belt around his stomach. All of a sudden, he heard laughter emanating form the sky. He looked up and saw the moon mocking him. Ganesha infuriated, broke off one of his tusks and hurled it at the moon. Parvati, seeing this, immediately cursed the moon that whoever looks at it on Ganesh Chaturthi will be accused of a wrong doing. The symbology behind the mouse and snake and Ganesha's big belly and its relationship to the moon on his birthday is highly philosophic. The whole cosmos is known to be the belly of Ganesha. Parvati is the primordial energy. The seven realms above, seven realms below and seven oceans, are inside the cosmic belly of Ganesha, held together by the cosmic energy (kundalini ) symbolized as a huge snake which Ganesha ties around Him. The mouse is nothing but our ego. Ganesha, using the mouse as a vehicle, exemplifies the need to control our ego. One who has controlled the ego has Ganesha consciousness or God-consciousness. The festival of Ganesh Chaturthi is celebrated the states of Maharashtra, Tamil Nadu, Karnataka and Andhra Pradesh and many other parts of India. Started by Chatrapati Shivaji Maharaja, the great Maratha ruler, to promote culture and nationalism, the festival was revived by Lokmanya Tilak (a freedom fighter) to spread the message of freedom struggle and to defy the British who had banned public assemblies. The festival gave the Indians a feeling of unity and revived their patriotic spirit and faith. This public festival formed the background for political leaders who delivered speeches to inspire people against the Western rule. The festival is so popular that the preparations begin months in advance. Ganesha statues installed in street corners and in homes, and elaborate arrangements are made for lighting, decoration, mirrors and the most common of flowers. Poojas (prayer services) are performed daily. 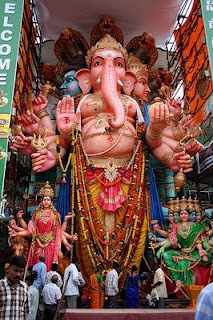 The artists who make the idols of Ganesh compete with each other to make bigger and more magnificent and elegant idols. The relevantly larger ones are anything from 10 meters to 30 meters in height. These statues are then carried on decorated floats to be immersed in the sea after one, three, five, seven and ten days. Thousands of processions converge on the beaches to immerse the holy idols in the sea. This procession and immersion is accompanied by drum- beats, devotional songs and dancing. It is still forbidden to look at the moon on that day as the moon had laughed at Ganesha when he fell from his vehicle, the rat. With the immersion of the idol amidst the chanting of "Ganesh Maharaj Ki Jai!" (Hail Lord Ganesh). The festival ends with pleas to Ganesha to return the next year with chants of "Ganpati bappa morya, pudcha varshi laukar ya" (Hail Lord Ganesh, return again soon next year. Ganesha Chaturthi, the great Ganesha festival, also known as 'Vinayak Chaturthi' or 'Vinayaka Chavithi' is celebrated by Hindus around the world as the birthday of Lord Ganesha. It is observed during the Hindu month of Bhadra (mid-August to mid-September) and the grandest and most elaborate of them, especially in the western India state of Maharashtra, lasts for 10 days, ending on the day of 'Ananta Chaturdashi'. A life-like clay model of Lord Ganesha is made 2-3 months prior to the day of Ganesh Chaturthi. The size of this idol may vary from 3/4th of an inch to over 25 feet. On the day of the festival, it is placed on raised platforms in homes or in elaborately decorated outdoor tents for people to view and pay their homage. The priest, usually clad in red silk dhoti and shawl, then invokes life into the idol amidst the chanting of mantras. This ritual is called 'pranapratishhtha'. After this the 'shhodashopachara' (16 ways of paying tribute) follows. Coconut, jaggery, 21 'modakas' (rice flour preparation), 21 'durva' (trefoil) blades and red flowers are offered. The idol is anointed with red unguent or sandal paste (rakta chandan). Throughout the ceremony, Vedic hymns from the Rig Veda and Ganapati Atharva Shirsha Upanishad, and Ganesha stotra from the Narada Purana are chanted. For 10 days, from Bhadrapad Shudh Chaturthi to the Ananta Chaturdashi, Ganesha is worshipped. On the 11th day, the image is taken through the streets in a procession accompanied with dancing, singing, to be immersed in a river or the sea symbolizing a ritual see-off of the Lord in his journey towards his abode in Kailash while taking away with him the misfortunes of all man. All join in this final procession shouting "Ganapathi Bappa Morya, Purchya Varshi Laukariya" (O father Ganesha, come again early next year). After the final offering of coconuts, flowers and camphor is made, people carry the idol to the river to immerse it. The whole community comes to worship Ganesha in beautifully done tents. These also serve as the venue for free medical checkup, blood donation camps, charity for the poor, dramatic performances, films, devotional songs, etc. during the days of the festival. house. Feel His Presence in it. Don’t forget not to look at the moon on that day; remember that it behaved unbecomingly towards the Lord. This really means avoid the company of all those who have no faith in God, and who deride God, your Guru and religion, from this very day. Take fresh spiritual resolves and pray to Lord Ganesha for inner spiritual strength to attain success in all your undertakings. May the blessings of Sri Ganesha be upon you all! May He remove all the obstacles that stand in your spiritual path! May He bestow on you all material prosperity as well as liberation!